Maximuscle Cyclone Protein / Creatine All in 1 supplement . Maximuscle Cyclone has always been very popular and continues to have a great following. Maximuscle Cyclone isn't a cost effective "Protein" supplement, but as an all-in-one total supplement mix Maximuscle Cyclone is pretty unbeatable. I (Pete) would be inclined to use Maximuscle Cyclone as per instructions (2 servings a day) but also use an economical whey protein several times a day to boost protein intake (like Reflex Instant Whey) If you’re looking for the ultimate ‘all in one’ formula for supporting muscle & strength goals....this is it! Maximuscle Cyclone - Maximuscle Cyclone is a superb product that delivers results fast, by supplying your body with a unique combination of whey protein and vital nutrients, needed by your body to support muscle growth, strength and recovery, whilst training hard. After intense training Maximuscle Cyclone accelerates muscle refueling, with faster recovery of glycogen stores than carbohydrates alone. Each Maximuscle Cyclone daily serving provides 10g of Maxpure Creatine Monohydrate, which research proves could increase muscle size and strength when combined with weight training. This is combined with dextrose, which increases Creatine uptake. Maximuscle Cyclone also offers you 3000mg of the finest HMB, which independent research has shown helps prevent muscle breakdown following weight training. To aid muscle growth, you also get nearly 50g of advanced Biomax whey protein, along with an extra 4g of Glutamine per daily serving and Ecdysterone, the Eastern Bloc plant that supports muscle recovery and growth. 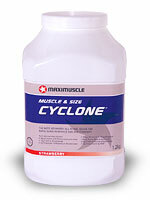 Maximuscle Cyclone is a excellent formula, with results felt within seven days. Mix 1.5 scoops (60gm) with 350-400ml of water. Stir with a fork or mix in a Maximuscle shaker. Drink within 5 minutes. Take 3 scoops daily. 1.5 scoops in the morning and another 1.5 scoops after training or in the afternoon. CYCLONE™ is designed to mix instantly with water without a blender and tastes great.